WTF: Gift Registry for a Kid's Birthday Party? 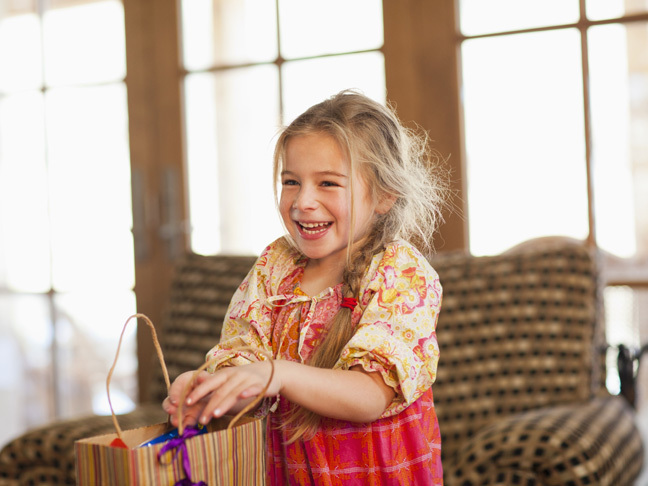 WTF: Gift Registry for a Kid’s Birthday Party? My son, Jack who is 7 has had his fair share of birthday parties. And just when I thought we’d seen it all: Bowling, Zoo, DJ Dance party, Swim, Karate, a visit from Sponge Bob, cupcake towers … my girlfriend recently topped it all when she told me her 2-year-old was invited to a party complete with a gift registry. You read that right: This mom took her kiddo to Target and zipped her around in a cart letting her zap all the presents she wanted (you know, as if she were creating a bridal or baby shower)! Think Play-Doh, Barbie, Crayola, and Disney Princess galore. On one hand I guess this is good if you’re a controlling parent, ahem, because I can tell you, I absolutely hate when my kid opens gift after gift of plastic crap. I wish I could just tell everyone to buy him PJs, or books, or iTunes bucks for the iPad, but it never occurred to me to expect parents to a. Bring a gift at all. b. Have time to buy a gift (I’ve been known to slip 10 bucks in a homemade card and call it a day), or c. Micromanage the parents by telling them what to bring. Birthday parties are a luxury for a lot of people and if a family can’t swing a gift for my kid I’d welcome them just the same (this has never happened, but still!). I’m also a little miffed that this young child was given free reign over a toy department with a registry gun, because that seems a little insane to me. What’s the message here? It’s your birthday, princess! Sky’s the limit. (You know this kid is getting a super sweet 16 in 14 years!). To each his own, but I would never attach a registry to a KID INVITE, and quite honestly, if someone invited my son to a party with a gift registry, I’d give PJs or cash, because I don’t support this trend.